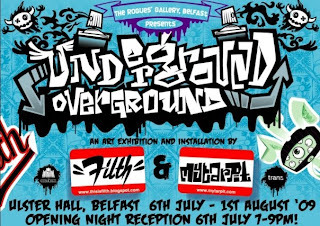 FRESH FROM BERLIN AND LA, HOME-GROWN, FREE-ART MOVEMENT INSTIGATORS, MYTARPIT AND FILTH ARE TAKING THEIR UNDERGROUND ART UPSIDE AND UPSTAIRS AND INFECTING THE WALL OF THE ULSTER HALL WITH THEIR OWN ANARCHIC CHARACTER DESIGNS AND BUSTED DECKS. JOINED BY OTHER ARTISTS, LOCAL AND INTERNATIONAL, THIS SPRAY-CAN-WALL-ART-STICKER-FEST PROMISES TO OPEN YOUR EYES TO A WHOLE NEW WORLD OF 'ART'. We will also be launching another event at the Black Market so head over and ask us what it is if we don't attack you about it first! More details here soon if you can't make it!